This day was the Passover for Pharisees and Sadducees from Jerusalem, in Judea to the south. Jesus was tried before Pilate, sent to be tried before Herod, returned to Pilate for the final judgment, sent to be scourged and was then offered to be released to the crowd. A political prisoner Barabbas released to the crowd instead by the crowds demands and Jesus was sent to be put to death. At the Crucifixion, Jesus died at the ninth hour (3 PM) which was the exact hour the Passover lambs were being sacrificed in Jerusalem for the Passover meal. He was buried in a borrowed tomb. Here is the timeline and Scriptural account of the events of the day Jesus died. Jesus departed with His disciples from the observance of the Passover meal, during which He showed the fulfillment of the Passover by instituting the Lord’s Supper. As they left, singing a hymn, they went to the Garden of Gethsemane, where Jesus was going to pray. He left all the disciples except for Peter, James, and John – those that were the closest to Him – and went to find a place to pray. As He prayed, Jesus knew what He was facing! He knew the death that awaited Him in order that the Divine plan of salvation might be accomplished. He had been born to die and now death was near at hand. Jesus was fully God (the spirit is willing) and knew what He had to do. He was also fully man (the flesh is weak), and He did not want to die! What a fearful thing to be facing the torment of bearing the full wrath of God toward sin. He prayed specifically, “O My Father, if it is possible, let this cup pass from Me; nevertheless, not as I will, but as You will.” Then He came and found the disciples asleep! He awoke them and asked them to watch and pray with Him, and He went back to fall on His face before the Father. He prayed again, “O My Father, if this cup cannot pass away from Me unless I drink it, Your will be done.” He knew that drinking this cup meant to do what He had come to do, to be humbled as a man and crucified on a cross. And the disciples fell asleep again, so He left them there and returned to pray a third time, saying the same thing. The weight of bearing the wrath of God had already begun and while Jesus prayed the blood vessels in His face began to burst due to the stress, and He began to sweat great drops of blood. His face was bruised from the weight of the cross, and He had not yet even been arrested! Then as they got up and moved to arrest Him, Peter stepped up to defend Jesus even if it meant his own life. He drew his sword and tried to strike one of the men approaching. It was Malchus, a servant of the High Priest. As Peter swung the sword and Malchus ducked out of the way the sword missed lopping his head off but did take his ear off! Jesus instructed Peter to put the sword away, for “all who live by the sword will die by the sword.” This was not a statement of pacifism, as Jesus had even told His disciples to buy and carry swords for defense against wild animals and robbers. He meant in this instance that if Peter killed Malchus, Peter himself would be put to death. With that Jesus healed Malchus’ ear completely! And He went to be tried as His disciples and a young man named John Mark fled and ran for their lives. Jesus was taken and brought before Annas and Caiphas, the High Priest, and charged with blasphemy. These men would decide the crimes to be charged against Jesus when He would stand trial before the Sanhedrin. Here they were accusing Him, complete with a list of witnesses who lied, of a crime punishable by death. They were set on killing Him. Jesus was struck and spit upon, and at one point even blindfolded and hit in the face as those striking Him cried out, “Tell us who hit you.” He was mocked and condemned. While Jesus was being questioned by the High Priest, Peter stood with John out in the courtyard. Here Peter was accused by a servant girl in the crowd of being a follower of Jesus. He denied he knew Jesus. A little while later another girl saw him and said that she had seen him with Jesus. He swore an oath that he did not know Jesus and had no idea what this girl was talking about. Then again after a time someone accused him of knowing and being with Jesus, saying he talked like he was from Galilee. At this point, the third time Peter denied Jesus, he cursed and said that he did not know the Man. Immediately after this, the Bible records for us that Jesus saw Peter through a window. They made eye contact. And Peter remembered the prediction he had refused to believe, that he would deny Christ 3 times before dawn. And he had. He fled the courtyard and went out a wept bitterly at having denied His Lord. At dawn, Jesus was taken with the charges against Him from the High Priest and tried before the Sanhedrin, the highest court in Israel. They quickly found Him guilty of blasphemy, and sent Him to Pilate so that He might be put to death. Pilate, the Roman Governor of Palestine, representing Caesar and acting as the highest ranking military and civil officer in that area, had to approve all cases demanding the death penalty. He interviewed Jesus and declared that He was innocent! In fact, while questioning Him, Pilate determined that this was not a case for death and so the local officials, namely King Herod, could rule on the case. So Pilate sent Jesus to Herod. King Herod Antipas, powerful but nothing more than a puppet for Rome, was the son of Herod the Great, who of course had met with the Wise Men after the birth of Christ and had ordered all the male children 2 and under to be slaughtered in an attempt to prevent the birth of a new king! He died before Joseph and Mary and Jesus returned from their flight to Egypt. Herod Antipas though was more interested in Jesus and His miracles. He was not interested in trying Jesus. He just asked Jesus to perform “tricks” for him! Herod heard the accusations against Jesus from the Jewish leaders, placed a flowing velvet robe on Him mocking Him, and sent Him back to Pilate. So the Roman guards took Jesus and scourged Him. They likely used a cat-of-nine-tails. It was a rod with 9 strips of leather tied to the end, and at the end of these leather strips where embedded pieces of bone, sharp rocks, and metal. 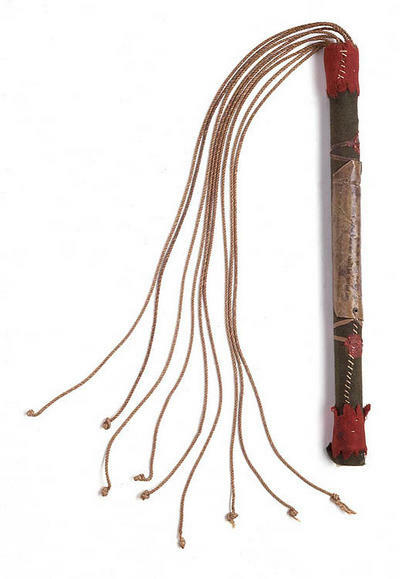 This whip was used to lash prisoners. A skilled punisher could use the whip to lodge these sharp pieces into the chest of the criminal and then yank it all loose stripping off pieces of flesh from the chest and stomach all the way around to the back. The guards crowned Jesus with a crown of thorns after this. They did not use a crown like what we see in most artwork. It was like a ball cap without a bill, a hat woven out of the branches of a short thorn bush that produces thorns an inch and a half to two inches long. This was beaten into Christ’s head with a rod. They took the robe Herod had given Him and pressed it into His bleeding back and mocked Him as a “king.” As the blood from the wounds in His back dried into the thick purple robe, they ripped the robe off again, opening the wounds afresh. They spit on Jesus, ripped His beard out, and continued to hit His head with the reed. At this time, Jesus was already weak from the loss of blood. His face was bruised from both sweating drops of blood in the Garden and from being hit, beaten, slapped, and His beard pulled out. He was bleeding from His face, back and sides, and His head. And they took Him to the place of the skull. It was a small hill outside the city gates where people were put to death for their crimes. This hill was called “Golgotha” which means “place of the skull”. 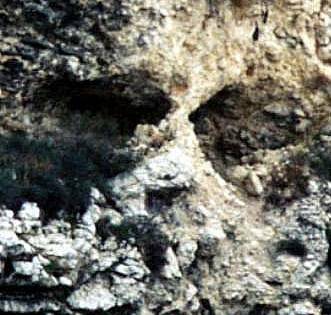 It was so named because it looked like it had a skull protruding from its side with caves forming cavities. He was forced to carry the cross beam that He would be nailed to as He was crucified. He dropped it on the way, and the most amazing thing happened. A man named Simon from Cyrene was pulled from the crowd and forced to carry the cross for Jesus. (Simon’s son Rufus is later mentioned as part of the church in Rome – Rom 16:13.) Look at what is happening here. Jesus is bearing the weight of our sin and even in the midst of the full wrath of God, grace and mercy is shown in that someone else carried the cross!! Arriving at the place to be crucified Jesus was offered pain killer but refused. He would not find any loss of His senses as He bore the pain of death for our sin. He was stripped of all clothing and nailed to the cross – His hands (through the wrist) and His feet, one over the other with the nail piercing through the top of both feet and exiting the heel into the cross. The charge against Him was nailed to the top of the cross, identifying in 3 languages that “This is Jesus of Nazareth, the King of the Jews.” At noon, as He hung on the cross, the sun was hidden and everything was dark until 3:00 PM. 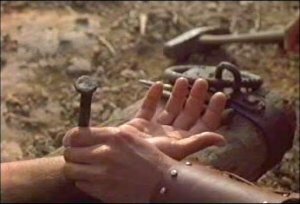 During this time, in order to take a breathe on the cross, Jesus had to push up on the nail in His feet and pull up on the nails in His wrists, scraping His already sliced back up and down on that wooden cross. Those who died on a cross usually died of suffocation – not being able to have the continued strength to pull up and take a breath. 2. “Woman, behold your son.” (Spoken to Mary His mother, identifying the Apostle John as the one who would take care of her in His absence). 3. “Behold your mother.” (Spoken to John about Mary). 4. “Assuredly I say to you, today you will be with Me in Paradise.” (Spoken to the thief who believed in Him and would join Him in heaven that very day). 7. Father, into Your hands I commit My Spirit.” (He knew He would go to be with the Father upon His death). 8. “It is finished.” (Tetelestai – PAID IN FULL – He had paid the debt we could not pay). And He died. When He died the veil of the Temple was rent in two – now man had access through the blood of Christ directly into the presence of God. No other High Priest or sacrifices or rituals. He was the High Priest and the sacrifice, once for all. When He died, He did not die from suffocation, or blood loss, or the beating, or the crucifixion. He willingly gave up His life. He chose the moment He would die! He died not due to the physical torments of the crucifixion. He died willingly as a result of bearing the wrath of God for our sin upon Himself. He tells us He gave up His life willingly so that He could take it up again – referring to the resurrection. He was always God! He was always in control. He chose when to die, and when to be raised from the dead. All to pay for our sin! A guard standing by would usually break a criminals legs in order to hasten death – he could then not push up and keep breathing. But when they came to do this to Jesus He was already dead. They stuck a spear in His side to check and pierced His heart and both blood and water came out of the wound, a clear sign that He was dead. Upon seeing Him die, the Centurion in charge of the execution believed that He was the Son of God – fulfilling the prayer, “Father, forgive them.” Surely this man was the Son of God. And He gave His life willingly to pay for our sin and save us. He made of Himself a substitute. Hebrews 12 tells us that through the pain, the torment, the abandonment, the shame, and all that He did to pay for our sin, through all of that He had one thing in mind. Therefore we also, since we are surrounded by so great a cloud of witnesses, let us lay aside every weight, and the sin which so easily ensnares us, and let us run with endurance the race that is set before us, looking unto Jesus, the author and finisher of our faith, who for the joy that was set before Him endured the cross, despising the shame, and has sat down at the right hand of the throne of God. This is how Jesus died. He had come to seek and save that which was lost, and just as the angel told Mary before He was born, He would save His people from their sin. He had come to do this. He was born to die. And He died to save His people from their sin.